Coating measurements with high precision and high resolution is an important issue in process- and quality-control. In these areas it is necessary to measure the thickness of the complete coating and also of each individual layer. Traditional nondestructive measurement methods like eddy current were limited to the substrate material and could not measure individual layers. Using the ultrasonic impulse-echo method, those limitations could be overcome but up to now resolution has been insufficient. The coating thickness measurement instrument CTM 20 (Fig. 1) combines the latest technologies for the ultrasonic probe and the instrument to solve all these limitations. A broadband PVDF probe combined with an instrument using digital signal processing on a DSP, increase measurement resolution. Overlapped reflection echoes coming from very thin coatings can be separated and will be displayed as digital values. The measurement range of the system is from 10 µm to 500 µm with a resolution of 1 µm. On a multi-layer system, up to three individual coatings including the total coating thickness can be measured in one pass. The new instrument includes a high precision measuring mode for wall thickness through coating(s) with a range of 100 µm to 8 mm for metals and 200 µm to 3 mm for plastics with a resolution of 1 µm. The CTM 20 allows quick and easy measurements of coatings on many different substrates, such as plastic, wood, ceramic, glass or metal which are not possible up until now. A wide range of applications in the automotive, wood and plastic industries can now be solved. The performance of the instrument can be clearly seen in different applications when measuring single- and multi-layer coatings. The advantage of using ultrasonics for measuring coatings compared to eddy current is that this method is independent of substrate material and can measure individual layers. But the traditional pulse echo method is limited by the minimum coating thickness that can be resolved. The resolution is understood as the minimum distance between echo pulses coming from the layer, that can still be separated. In Fig. 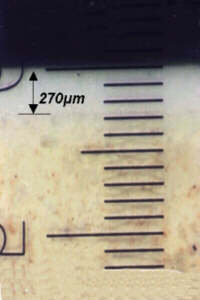 2 reflection signals from a polystyrene coating layer using a 15 MHz schock-wave probe are shown and it is possible for traditional thickness measurements to be made down to approximately 200 µm. The wavelength of a 15 MHz signal in plastic is about 150 µm. So due to the wavelength limitations, the echoes of this probe are superimposed on each other and the time of flight difference of the echoes can not be determined. To increase the resolution having "shorter" echoes, a new ultrasonic probe was developed. This probe is theoretically characterised by generating a triangular pulse with a width of 2d/c (d = thickness of piezoelectric transducer, c = sound velocity) using a sharp transmitting pulse [2,3]. Due to bandwidth limitations of the system the signal looks like a Gauss pulse. To reduce this influence the transmitter and broadband receiver are build into the probe. Polyvinylidenefluoride (PVDF) is used as piezoelectric material which has broadband frequency characteristics. The disadvantage of less sensitivity of this material compared to ceramics is compensated by good matching of the acoustic impedance to plastics. Therefore signal losses from the interface probe/coating are reduced as both have similar impedances. The newly developed probe CTF 1 generates shorter echo signals allowing a considerable improvement in thickness measurements (Fig. 3). As shown in Fig. 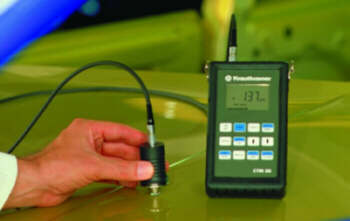 3 traditional coating measurements with the new probe using ultrasonics are also limited to about 50 µm. Signal processing is used to overcome the wavelength limitation for coating measurements and to measure the time of flight difference of two superimposed echoes. As the generated ultrasonic pulse propagates through the material it is influenced and then received by the probe. A simplified block diagram of the system including the test object shows the main signals (Fig. 4). The transfer function of the test material - here the coating including couplant - is represented by the block h(t) (pulse response). The measured echoes y(t) can be described as the convolution of the input signal x(t) and the transfer function h(t). The input signal x(t) can be measured when h(t) is shorted, that means the probe is not coupled to the test material and the interface echo probe/air is stored. When x(t) is stored and y(t) is measured h(t) can be calculated, this is called deconvolution. Deconvolution can be made in the time domain or by using the Fourier transformed signals in the frequency domain [4, 5, 6, 7, 8, 9]. The differences in the test object's acoustic impedance is a precondition for receiving echoes. Ultrasonic measurements are based on the reflection of signals at the interface of two materials having different impedances. The impedance Z of a material is defined by its sound velocity c and the density r.
Therefore the amplitude of the echo sequence on the interfaces can be calculated due to multiple reflections. Based on the described principle, the reflection model allows to simulate multilayer (L) systems, when the impedance and the thickness (d) of the material (Mat; PS = substrate, PX = coatings) is given (table in Fig. 5). With this model it can be verified if coating measurements are able to be done, when the difference of the impedance is small. In the example (Fig. 5) the theoretical reflection model of a three layer system on a plastic substrate including the couplant is shown and in Fig. 6 the real measurement is given. With the new probe already described and the signal processing with a DSP, the CTM 20 displays the thickness value for the coatings. Sometimes it is helpful to see the A-scan of the measurement. After a PC is connected to the instrument this is possible using the software C-SOFT. The operator can see the A-scan and the calculated position (bars) of the interfaces (refer to Figs. 6 to 8). The wall thickness mode enables the customer to measure the thickness without removing the coating. The measuring range for metallic materials goes down to 100 µm with a resolution of 1 µm, which opens up new applications for ultrasonic based systems (i.e. coated thin metal foils). A typical example from the automotive industry is shown in Fig. 6. The A-scan of this three layer system cannot be visually interpreted any more, as the echoes from the three interfaces are superimposed. But using signal processing the position of all echoes can be calculated, even the 2 µm thick couplant (tk) can be measured. 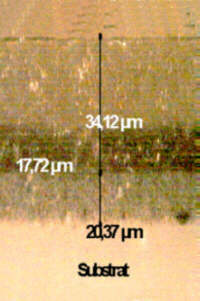 The three calculated coating thicknesses of 34 µm (s1), 17 µm (s2) and 20 µm (s3) are confirmed in the cross section picture. The thickness of the glaze of a ceramic tile in Fig. 7 is 272 µm (s1). The thickness of the adhesive layer on insulation tape could be easily measured by taping it to a smooth surface (Fig. 8). The thickness of the insulation tape is 108 µm (s1) and for the adhesive layer it is 26 µm (s2). McRae, K.I., Deconvolution Techniques for Ultrasonic Imaging of Adhesive Joints, Materials Evaluation (1990),1380. Papoulis, A; Chamzas, C.: Improvement of Range Resolution by Spectral Extrapolation, Ultrasonic Imaging 1,121 (1979). Levinson, N., The Wiener RMS (Root Mean Square) Error Criterion in Filter Design and Prediction, Journal of Math. Phys. 25,261 (1947). Schwetlick,. H.; Miyashita, T.; Kessel, W.: Schätzung einer Impulsantwort aus bandbegrenzten Daten, AEÜ 42,160 (1988). Zala, C.A. : High-Resolution Inversion of Ultrasonic Traces, IEEE Trans. Ultrasonics and Frequency Control 39,458 (1992). Kreyer, P.; Gut, R.; Moschytz, G.S. : Genaue und automatisierte Schichtdickenmessung mittels Entfaltung von Ultraschall-Laufzeitsignalen, DGZfP Jahrestagung (1996).